Donal Skehan’s straightforward chicken tagine recipe is bursting with spices and fruity flavour – the aromas released as it cooks will have you and the people you’re cooking for salivating. In a bowl, toss the chicken with the spices, cover with cling film and chill for at least 1 hour, or overnight. Meanwhile, soak the apricots and raisins in a little of the hot stock and set aside for at least an hour. Heat the oil in a large, deep-sided frying pan over a high heat. Add the chicken in 2 batches and brown all over. Remove from the pan using a slotted spoon and set aside on a plate lined with kitchen paper. You should be left with a rich golden oil in the pan, but add extra rapeseed oil if required. Fry the onions over a medium heat for 4-6 minutes until soft, stirring through the garlic for the last minute. Add the saffron along with its water, and the tomatoes, tomato purée, honey, fruit and soaking liquid. Pour in the remaining chicken stock and bring to a steady simmer. Cook for about 10 minutes, then season with sea salt and ground black pepper. Return the browned chicken pieces to the pan and carefully stir through. Simmer, partly covered, for 20 minutes, stirring occasionally, until the chicken is cooked through and the sauce has thickened. Put the couscous in a heatproof bowl and cover with 250ml boiling water. Cover the bowl with cling film or a clean tea towel and leave for about 5 minutes until all the water has been absorbed and the couscous appears plump. Use a fork to fluff up the couscous, then mix in the mint, lemon juice and most of the zest. Season with sea salt and ground black pepper. 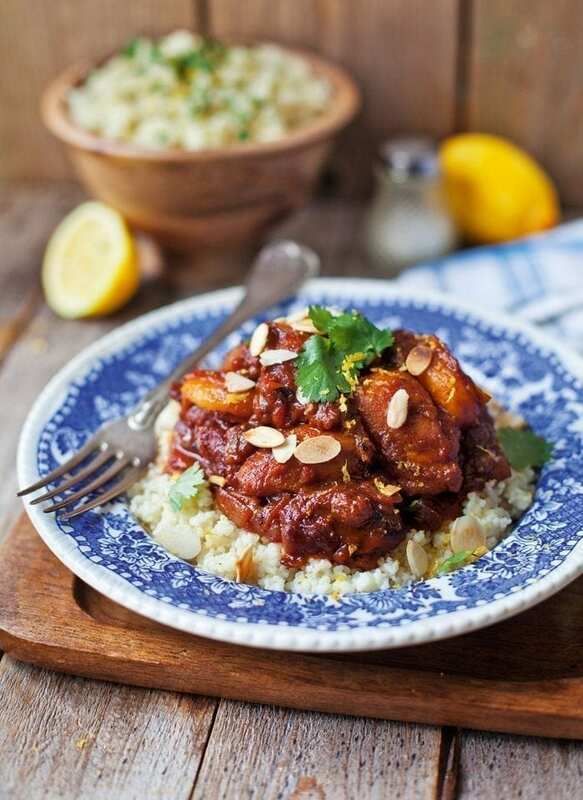 Serve the chicken tagine on top of a generous helping of couscous, with toasted flaked almonds, chopped fresh coriander and the remaining lemon zest scattered over. I like to use chicken thighs in my tagine because they give a deeper flavour and more interesting texture than chicken breast meat – and they’re less prone to drying out. To make the tagine with lamb rather than chicken, cut 700-800g lamb neck fillet into 3cm chunks, then follow the recipe below. The only difference will be the cooking time; cook over a low heat (or in a preheated oven at 150°C/fan130°C/gas 2), covered, for 3 hours or until the lamb is beautifully tender. Traditionally, the chicken would be slow-cooked in a tagine: a circular earthenware vessel with a high conical lid. If you have one, great – but there’s no need to go out and buy special equipment to make this simple dish. Using a large deep-sided pan with a lid, as I’ve done here, will produce equally flavourful results. Disappointing meal, it needed far longer to cook out the tomato sauce which would also improve the depth of flavour before adding the chicken. We scored it 7/10.